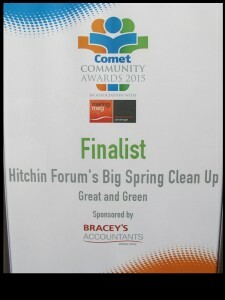 Hitchin Forum’s Big Spring Clean was a finalist at the Comet’s Community Awards event on May 15th – full account from the Comet here. We were nominated in the ‘Great and Green’ category, won by Camps Hill School in Stevenage, where pupils have an allotment, rescue chickens, as well as clear up litter locally. Worthy winners! Many other splendid people were celebrated in other categories, with carers and community workers doing amazing things. Hitchin champions were recognized with Siobhan Eckersall from Hitchin Girls’ School being named as Teacher of the Year, and the title of Valiant Volunteer went to Lorna Hemmings of Hitchin’s Volunteer Army. The event was well staged by the Comet, who we thank for their efforts in the community, and we are grateful that we didn’t have to pick up any litter afterwards. With thanks again to all of the volunteers who did such a good litter picking job on April 26th! Lynne Maylin and Ellie Clarke, the organisers, represented Hitchin Forum at the award ceremony.